The awesome east face of Castle Dome catches the light of the rising sun. 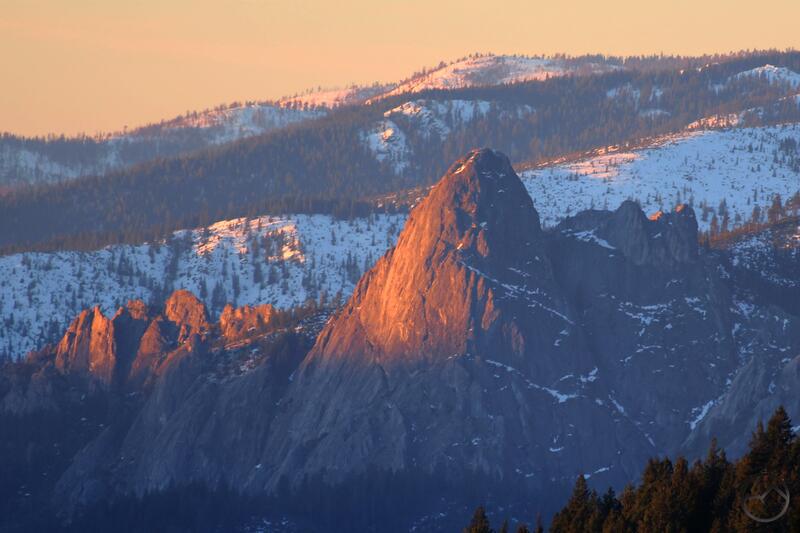 After Mount Shasta, the Castle Crags are the most stunning feature in this part of California. The rugged collection of towering granite spires and domes is an awe-inspiring edifice looming majestically above the Sacramento River. Travelers coming up the Sacramento River Canyon on I-5 are treated to magnificent views of the Crags, seeing them close-up well before getting more than a peek at Mount Shasta. It is a grand introduction to the area and one that would be a premier attraction on its own, if a massive 14,000 foot volcano didn’t lie just to the north. Though there are higher and more rugged peaks and spires withing the Castle Crags, only Castle Dome has earned itself and official name. It alone, of all the Castle Crags has the privilege of a distinct and universally agreed upon identity. Many other towers, walls and points withing the Crags have unofficial monikers, often bequeathed by climbers who scale the granite cliffs. These, however, are not widely known and not always widely accepted. Castle Dome, on the other hand, has long held its name and it is one that is known casually by locals, even by the non-climber and non-hiker. The reason for Castle Dome’s singular recognition is self-evident: it is spectacular tower that, though relatively short compared to the rest of the Crags, stands apart from the rest of the formation, has a distinct appearance and boasts an incredible wall on its east side. This is perhaps best enjoyed from the ought-to-be-iconic view at the base of Root Creek Falls, where the awesome waterfall plunges over a series of tiers while Castle Dome looms majestically overhead. Castle Dome caught the attention of the first scientific expedition that passed through the Mount Shasta area in 1841. 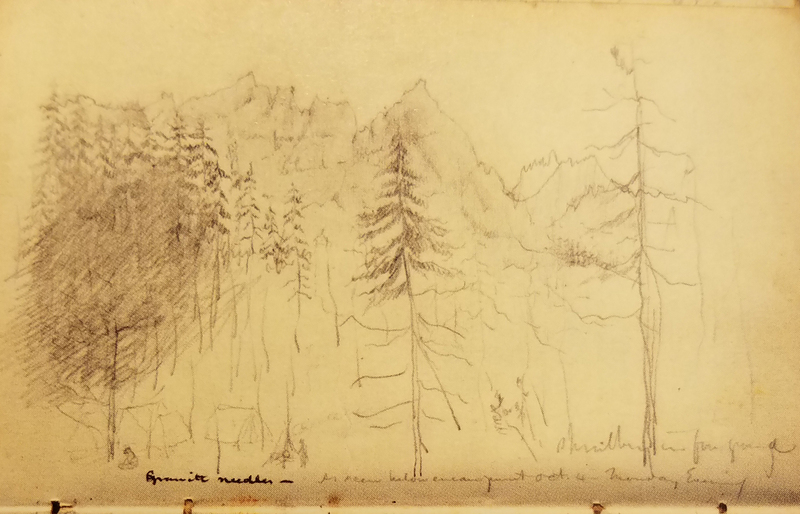 This sketch was drawn in 1841 by James Dana, the United State Exploring Expedition’s geologist. Castle Dome is the pyramidal peak above the tree in the center. It is a similar view to that to be had in the Root Creek Drainage. Castle Dome, and the rest of the Castle Crags, are a large granite pluton that has been extruded from within the earth amidst a sea of rocks composed of marine sediment. Consequently, Castle Dome’s appearance stands in sharp contrast to the other peaks of the Trinity Divide, the large mountain range that rises west of Mount Shasta. The appearance and composition of these peaks is very similar to the highest parts of the nearby Trinity Alps as well as to much of the Sierra Nevada. Indeed, it is to these famed mountains that the Castle Crags draw their most favorable comparisons. The northern part of the Sierra and the Klamath Mountains, of which the Castle Crags are a part, or nearly identical geologically. Whether a climber, hiker or general lover of mountains, the similarities between the Crags and the Sierra Nevada is almost unavoidable. This is certainly the case with Castle Dome. The Sierra is known for its domes (among many other excellent attributes) and Castle Dome would fit right into that notable company. Its contours are reminiscent of famed Sierra domes like Fin Dome or the giant Tehipite Dome. Though not as large, Castle Dome’s lines are equally pleasing. 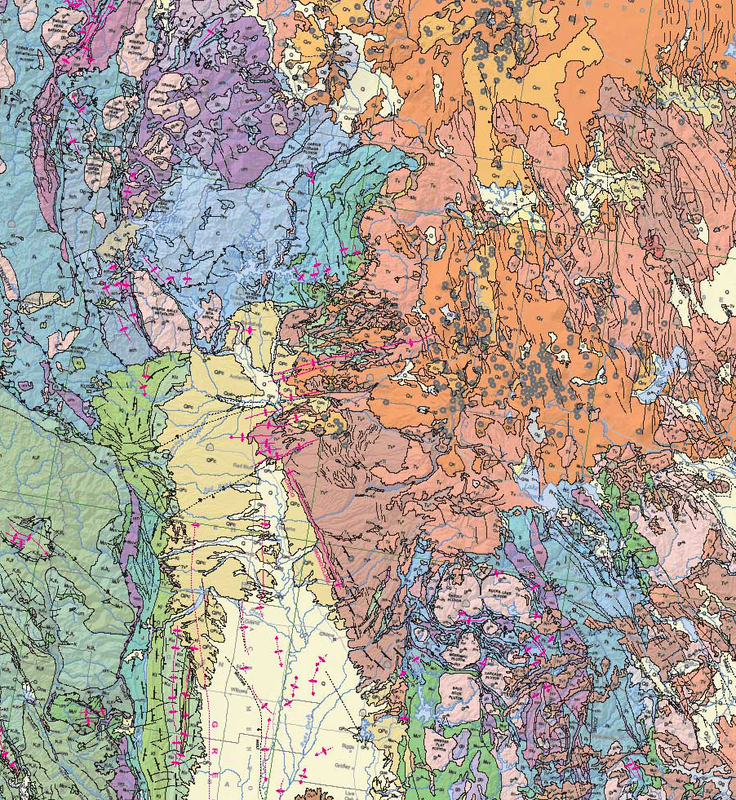 In this section of the Geologic Map Of California, the similarities between the Klamath Mountains (upper left) and the Northern Sierra Nevada (lower right) are easy to spot. The blue areas with the large pink regions are seen in both ranges. The blue is marine sediment while the pink areas are granite plutons. 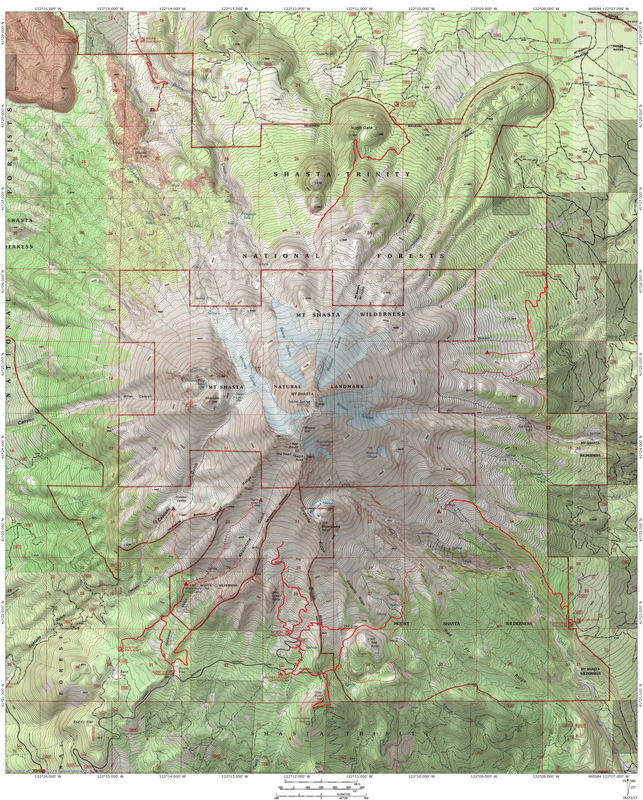 It is worth noting that, other than Mount Shasta and its subordinate peaks like Shastina and Red Butte, Castle Dome is the only officially named peak in the area that is located in a wilderness area. It is often thought of as being inside Castle Crags State Park. This misconception is easy to understand since all the approached to the Dome pass through the state park. 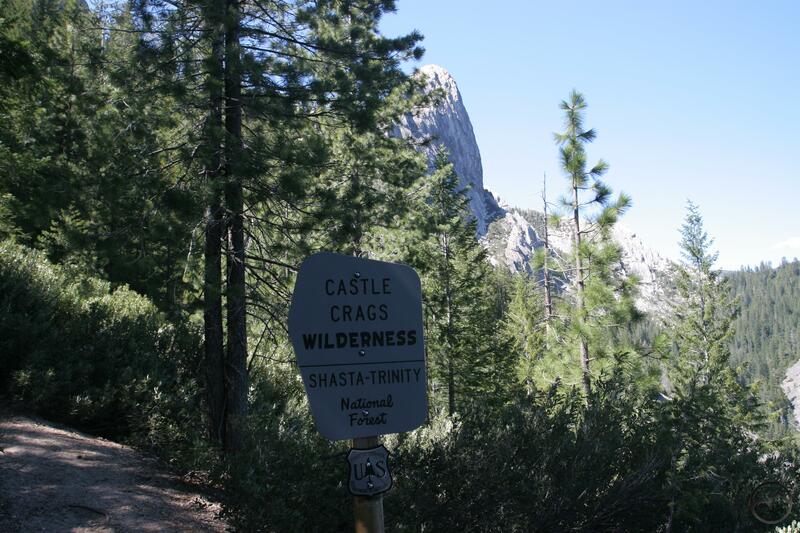 In truth, Castle Dome and the vast preponderance of the Castle Crags are a part of the Shasta-Trinity National Forest. Consequently, the Crags and many nearby peaks and lakes were made a part of the 12,232 acre Castle Crags Wilderness. This wilderness consists of 2.5 alpine lakes basins and the incredible jumble of granite towers that is the Castle Crags. Its elevation extends from 2,600 feet along Root Creek to 7,200 feet at the summit of Harry Watkins/Soapstone Peak. Due in part to the peak’s lower elevation and its separation from the rest of the towers of the Castle Crags, Castle Dome is easily the most frequented tower in the Crags. The Castle Dome Trail is the only maintained trail that accesses the granite high country of the Castle Crags. A large open bench separates the dome from the rest of the Crags. This trail offers hikers access to the base of Castle Dome as well as rock climbing areas on the spires that lie immediately to the west, on the far side of the bench. The iconic view of Mount Shasta from the trail up to Castle Dome is one of the most memorable images of the region. Hikers aren’t alone in appreciation of this area. Castle Dome has an almost legendary status with rock climbers, offering a variety of climbing routes that include the classic 8 pitch Dike Route. For more information on the climbs around Castle Dome, check out Grover Shipman’s excellent Mt. Shasta Area Rock Climbing. Castle Dome deserves a larger reputation that it currently does. This is in large measure a product of the fact that the dome is a small part of a greater, spectacular whole. The Castle Crags as a single entity will always be greater than any one of its domes or spires. Nonetheless, Castle Dome stands apart, both physically but also in many other ways. It alone of all the peaks in the Castle Crags can be appreciated by hikers as well as climbers. It can be viewed from many trails, both around the Crags but also from other peaks, especially Mount Shasta. Its beauty, accessibility and spectacular features make it one of the most noteworthy peaks in the Mount Shasta area. I so love your photos, and want to thank you so much for generously sharing. Could you please tell me which trail or ridge you were on when you took the first picture of Castle Dome? I am sorry I missed this comment earlier. To answer your question, this is taken from the flanks of Everitt Hill, which is just west of the Ski Park Highway. Thanks! Very interesting. I had never heard of the expedition.